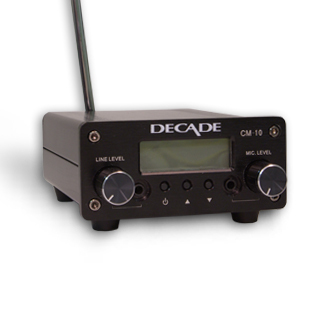 The CM-10 is a consumer grade low power FM transmitter operating in the commercial FM band (88.1 - 107.5 MHz). It is especially designed for in-house broadcasting, gyms and fitness centres and small rooms for a variety of entertainment, hearing assistance, translation, and information applications. Its excellent RF and audio performances, small size and ease of use make the CM-10 stand out from all the other consumer grade FM transmitters on the market. IMPORTANT: PLEASE TAKE NOTE THAT THE CM-10 IS NOW DISCONTINUED. • Frequency tolerance : ±0.005% max. • Spurious rejection : 35 dB min. • Harmonic distortion : 0.5% max. • Signal-to-noise ratio : : 55 dB min., 60 dB typ. • Stereo separation : 30 dB min., 35 dB typ.